What do I do if I am experiencing undeliverable email notices? Begin to enter the name of the individual/inbox you’d like to send an email to. Once the name is displayed in the cached “recent sender” list, select the X to the right of the name. This will remove the email address from your cached recent senders. 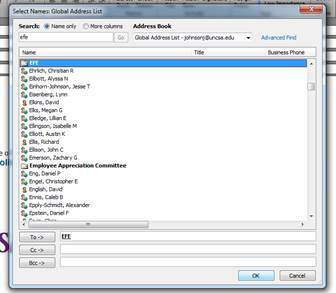 Once the cached address has been removed, you may select To to open up the Global Address Book. Locate the individual/inbox you’d like to email and select their name, then select Ok.
You may now compose and send your email as normal.